Photo: (from left, front row) Rotary Scholarship Committee Chairman Mike Heslep; Julia Gist, ASUMH; club President Mark Hopper, (back row) Martin Eggensperger, Glen Dimick, and Wes Wood. Committee members not pictured include Mary James, Scott Tabor, Mark Weber and Jack Clayton. 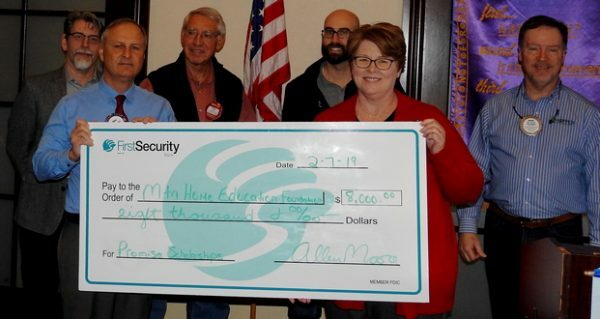 The Rotary Club of Mountain Home has presented $8,000 to the Mountain Home Education Foundation for The Promise, a free scholarship to Arkansas State University-Mountain Home for all Mountain Home High School graduates. The aim of The Promise is to allow area students to stay at home, continue to work local jobs, and receive an education debt free. The former director of the MH Education Foundation, Mollie Morgan, and Julia Gist, dean of health sciences at ASUMH, spoke to the club members and thanked them for the difference they are making in the lives of these students. Apart from the $8,000 donation for The Promise, Rotarians also awarded an additional $10,000 to area graduates to attend ASUMH or other universities and colleges across the country. Rotary scholarships and other local projects are funded by the community's support of Rotary's Annual Pancake Day.